The RAND Corporation kicked off its 2016 RAND Presidential Election Panel Survey (PEPS) with an initial survey covering late December 2015 and early January 2016, and will continue surveying through the months leading up to the presidential election in November. The PEPS is designed to examine voter attitudes, intentions, and choices, and how these change throughout the 2016 presidential election cycle using a representative sample of around 3,000 U.S. citizens over the age of 18. The PEPS will ask participants not only about their voting intentions and attitudes toward and preferences for potential candidates, but also opinions on a wide range of topics such as political and other issues in the news, and detailed information about the respondents themselves. The PEPS sample is drawn from the RAND American Life Panel (ALP). The ALP is an Internet-based panel of about 6,000 U.S. respondents ages 18 and older who regularly take surveys. In contrast to most Internet panels, ALP respondents need not have Internet access when they are initially recruited, reducing an important source of bias and making the sample more representative. A further contribution of the PEPS is that because it is based on members of the ALP, a variety of information from ALP surveys dating back to 2006 is available for many PEPS respondents, which can be used to construct a rich profile of individuals. For additional information about the surveys and methodology, see our methods document. We surveyed 3,037 members of the ALP between December 13, 2015 and January 6, 2016. As with other surveys, we weight responses to ensure that our results are representative of the U.S. (citizen) population, matching to the 2015 Current Population Survey. This survey comprises the baseline of the PEPS, and these ALP members will continue to be surveyed throughout the election cycle. Administering the baseline survey this early will enhance our ability to say with confidence whether opinions have or have not changed over the course of the campaign once the candidates start advertising, and the nominations become clear. These early measures will also help shed light on when an individual's position influences their choice of candidate, versus when a candidate's position influences an individual's views or position about issues. Because this is only the baseline wave of PEPS data, the major contribution of the effort — the longitudinal, panel aspect — is yet to be realized. However, even with the initial baseline wave, the PEPS can help shed light on unexplored and underexplored aspects of this election, a few of which are illustrated below. Although much has been written about the differences between “establishment” and “outsider” candidates in the U.S. presidential election, voters don't see each party's candidates as very ideologically different. Figure 1 presents the views of likely Republican and Democrat primary voters toward the political viewpoints of candidates as well as their own in December 2015. Respondents who indicated they were “likely to vote in a Democratic … or a Republican primary or caucus” were asked to report the political viewpoints of all candidates on a scale from 1 (very liberal) to 5 (very conservative). 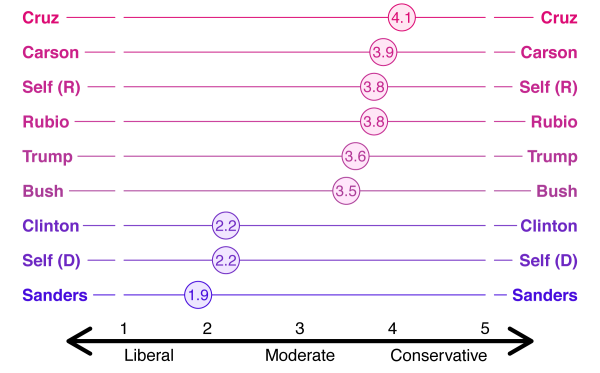 The average political spectrum scores for each candidate, and of survey respondents themselves, are presented in the figure, ranging from very liberal on the left, to very conservative on the right, and ordered vertically from the lowest to highest score. Here we present the views of Republican voters on Republican candidates, and Democratic voters on Democratic candidates. 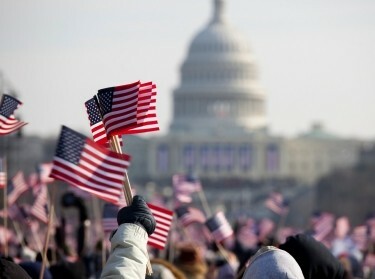 Republicans reported on their personal political viewpoint (Self [R]) as did Democrats (Self [D]). 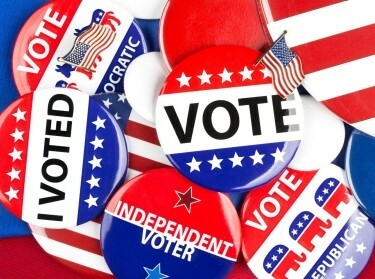 The PEPS will track how individuals' perceptions of candidate political viewpoints change over the course of the election cycle, a novel capability of this project. The average political viewpoints of Republican or Democratic candidates indicate that there are slight, yet statistically significant differences in how some of the candidates are viewed. Among the Republican candidates, Ted Cruz and Ben Carson are rated to have more conservative political viewpoints than Marco Rubio, Donald Trump, and Jeb Bush (the latter three are statistically indistinguishable from each other). 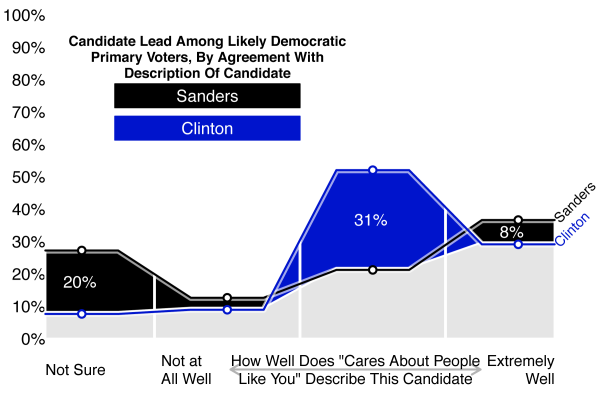 Among Democratic candidates, Bernie Sanders is rated to have a more liberal political viewpoint than Hillary Clinton. The difference is relatively small in size but statistically significant. Thus, for the Republican and Democratic candidates, there is some variation in perceived political viewpoint among candidates, but based on the double-digit leads Trump and Clinton have in polls over their nearest party competitors (Cruz and Sanders, respectively), the relatively small differences in perceived political viewpoints seem unlikely to be the sole factor driving candidate appeal. The rich set of background variables in the PEPS allows us to examine this more closely. The survey confirms Donald Trump (the favorite of 38 percent of likely Republican primary voters) and Hillary Clinton (57 percent of likely Democratic primary voters) as the national front-runners in their respective primary races. An important feature of the PEPS is that we assess voting intentions by asking respondents about their probability of voting, and then we ask them (assuming that they vote), what is the probability that they will vote for a candidate from each party. Combining these two responses gives us the overall probability that they will vote for a particular party and allows us to predict the overall vote for each party or candidate. Additional information about the methodology is available our methods document. On average, PEPS respondents in this inaugural survey report a 47 percent chance of supporting the Democratic candidate in November 2016, a 43 percent chance of voting for the Republican candidate, and a 10 percent chance of voting for some other candidate. While at this very early date, general election polls do not yet reliably predict the final outcome, this provides a baseline we can use to track opinions in the months ahead — and to track people's movements into and out of these camps. 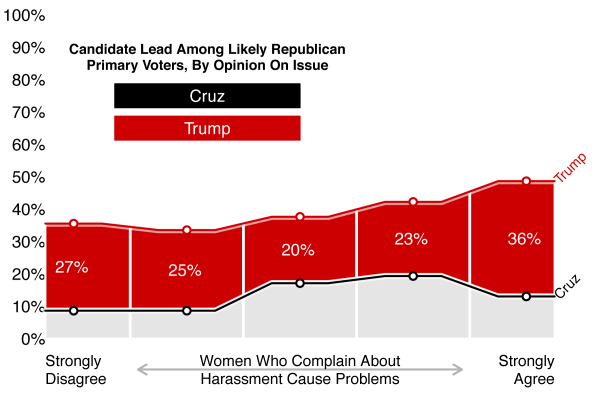 For example, Trump performs particularly well against his closest contender, Ted Cruz, among likely Republican primary voters who both strongly believe that “immigrants threaten American customs and values” (Figure 2) and that “women who complain about harassment cause more problems than they solve” (Figure 3). 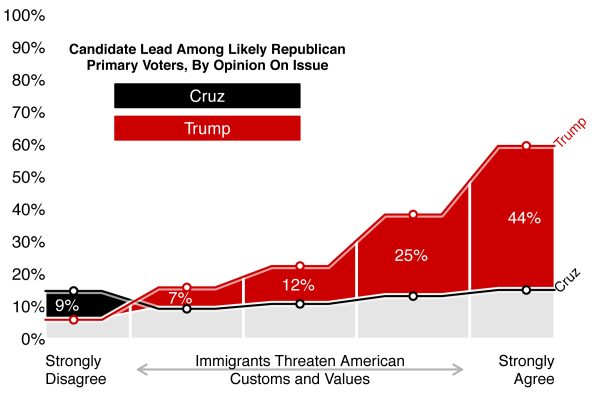 For example, among likely Republican voters who support either candidate and strongly agree that “immigrants threaten American customs and values,” 60.1 percent say they prefer Trump and 15.6 percent say they prefer Cruz. Trump's lead in support grows progressively larger moving from left to right, corresponding to groups of voters with increasingly strong agreement with the statements. The more strongly voters agree with these two sentiments, the greater the gap between support for Trump and Cruz. 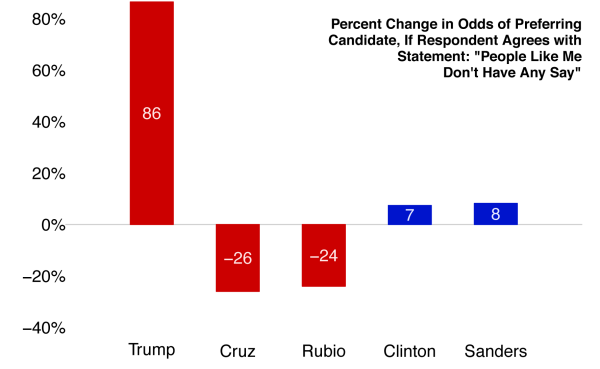 Trump also beats Cruz among likely primary voters who have liberal positions on economic issues. 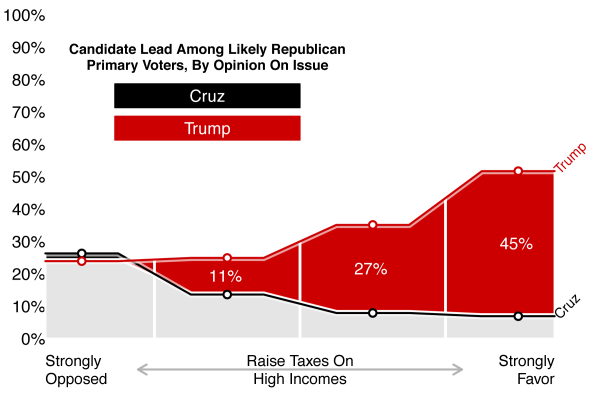 Trump does better among those who strongly support tax increases for the wealthy (incomes over $200,000) and support labor unions (Figures 4 and 5, respectively), while Cruz does worse. The same pattern emerges with other economic issues, such as raising the minimum wage and a single-payer health care system (not shown). Among GOP primary voters, there is a substantial proportion with relatively liberal positions; 51 percent of Republican primary voters strongly or somewhat favor increasing taxes on individuals who make more than $200,000 a year, and 38 percent have a favorable or very favorable opinion of labor unions, for instance. 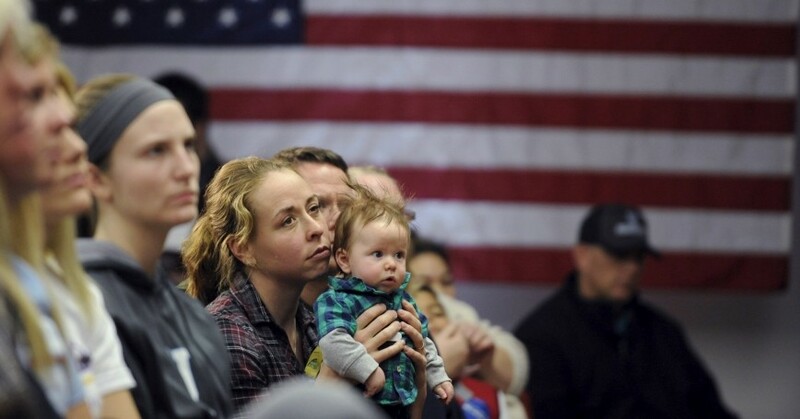 It appears, then, that Trump supporters form a powerful populist coalition uniting concerns about immigrants and other groups with support for economically progressive policies. Among people likely to vote in the Republican primary, people are 86.5 percent more likely to prefer Donald Trump as the first-choice nominee relative to all the others if they “somewhat” or “strongly agree” that “people like me don't have any say about what the government does.” Using statistical techniques, we can conclude that this increased preference for Trump is over and beyond any preferences based on respondent gender, age, race/ethnicity, employment status, educational attainment, household income, attitudes towards Muslims, attitudes towards illegal immigrants, or attitudes towards Hispanics. Figure 6: Percent Change in Odds of Preferring Candidate, if Respondent Agrees with the Statement, "People Like Me Don't Have Any Say"
Finally, when Democrats were asked how well the phrase “cares about people like you” describes each candidate, a significantly higher proportion of people reported that it described Hillary Clinton “extremely well” or “somewhat well” than it did for Bernie Sanders (83 percent versus 59 percent — See Figure 7), even though his message is commonly portrayed as being more resonant with issues like economic anxieties and voter anger. It is important to note that while 11 percent of people responded that they “didn't know” how to answer about Hillary Clinton on this question, 29 percent responded that they “didn't know” how to answer about Bernie Sanders. However, when they were asked about how favorable or unfavorable their opinions about each candidate were, only half as many — 16 percent — did not know how to answer regarding Sanders' favorability. This suggests that this is a specific dimension along which Bernie Sanders is relatively unfamiliar to people (at least as of December 2015). 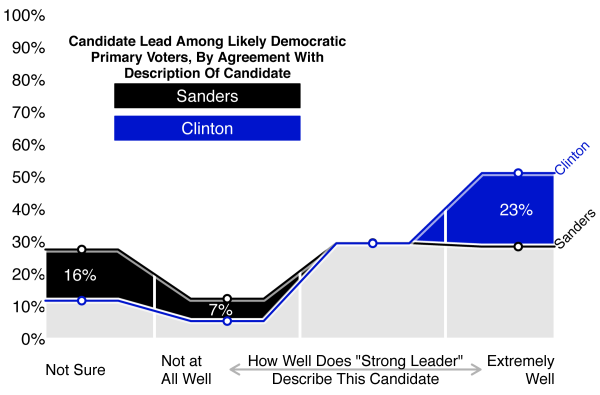 Likewise, as shown in Figure 8, nearly 30 percent of likely Democratic primary voters did not express an opinion about Sanders when asked whether he is a strong leader. In contrast, roughly 10 percent of likely Democratic primary voters did not express an opinion on the same items for Hillary Clinton. For those who did have an opinion, Sanders faces a significant deficit on the leadership dimension. The next planned wave of data collection for the PEPS is following Super Tuesday on March 1, at which point we will be able to identify individual-level changes in attitudes and intentions. Until then we will continue to present information from the rich baseline survey data. 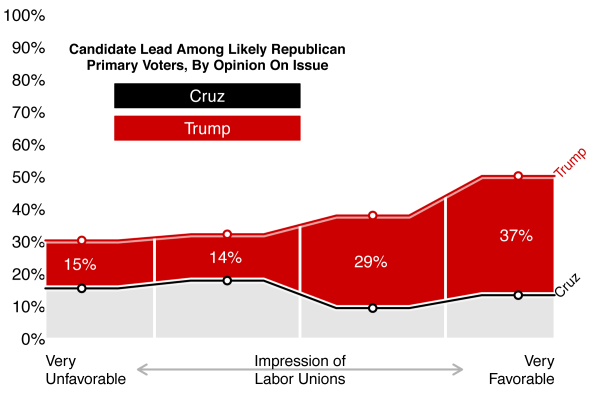 Figures 2 through 5 present the mean level of support for Cruz and Trump within outcomes groups, taking into account the whole field of candidates. Each outcome group includes respondents who marked a specific answer to a survey item. For example, all likely Republican primary voters who reported “strongly agree” to the survey item “immigrants threaten American customs and values” would constitute an outcome group. The shaded area between the lines reports how much of a lead one candidate has over the other, with black shading indicating that Cruz leads and red shading indicating that Trump leads. On some of the plots, no area is shaded black, indicating that Cruz does not have a higher percentage of supporters for any of the issue stance groups. Figures 7 and 8 present the mean level of support for Sanders and Clinton within outcomes groups, taking into account the whole field of candidates. Each outcome group includes respondents who marked a specific answer to a survey item. For example, all likely Democratic primary voters who reported “strongly agree” to the survey item “Clinton cares about people like you” would constitute an outcome group. The shaded area between the lines reports how much of a lead one candidate has over the other, with black shading indicating that Sanders leads and blue shading indicating that Clinton leads. Michael Pollard is a sociologist and Joshua Mendelsohn is an associate sociologist at the nonprofit, nonpartisan RAND Corporation.